We are located on the corner of Penrhyn Isaf Road and Maesgwyn Road in Penrhyn Bay. Take the Colwyn Road , North Shore B5115, to Penrhyn Bay. When you come down the Little Orme take the first exit on the roundabout onto Glan-y-Mor Road. Follow this road for approximately 1/2 mile when the sea will appear on your left. Maesgwyn Road is on your right with the Beach Restaurant on the far corner. Turn right onto Maesgwyn Road and the church is approximately 100 yards up on the right. Make your way to the junction of the A55( J19) and the A470. At this junction and take the A470 heading for Llandudno. For the next 2 roundabouts carry on a direct route for Llandudno. On the third roundabout take the third exit, right, sign-posted for Penrhyn Bay. Follow this Gloddaeth Lane for approximately 2 miles. At the end is a mini roundabout. Head straight on at this roundabout onto Marine Road. After 400 yards you will came to a junction with Penrhyn Isaf Road. Turn left. After 75 yards you will come to the church at the corner of Penrhyn Isaf Road and Maesgwyn Road. Directions from North East Wales and England. Head towards North Wales on the A55. Exit at Junction 20, Rhos-On-Sea. There is a set of traffic lights immediately off the slip road at which you should turn right. Within 50 yards there is another set of traffic lights at which you must turn right. Follow the road for 150 yards at which there is a small roundabout. Turn right onto the B5115 heading for Llandudno. Follow this for another 200 yards at which there is another roundabout at which you take the heading for Llandudno, 3rd exit. Follow this road for approximately 2 miles. 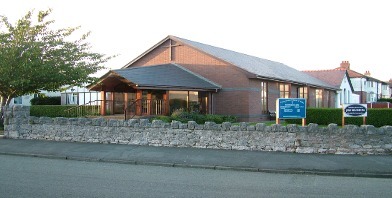 It will take you past (all on your right) Llandrillo church, then Llandrillo College, then Rhos-On-Sea golf course. You will come to a mini-roundabout. Take the third exit (right) onto Marine Road. After 400 yards you will came to a junction with Penrhyn Isaf Road. Turn left. After 75 yards you will come to the church at the corner of Penrhyn Isaf Road and Maesgwyn Road.